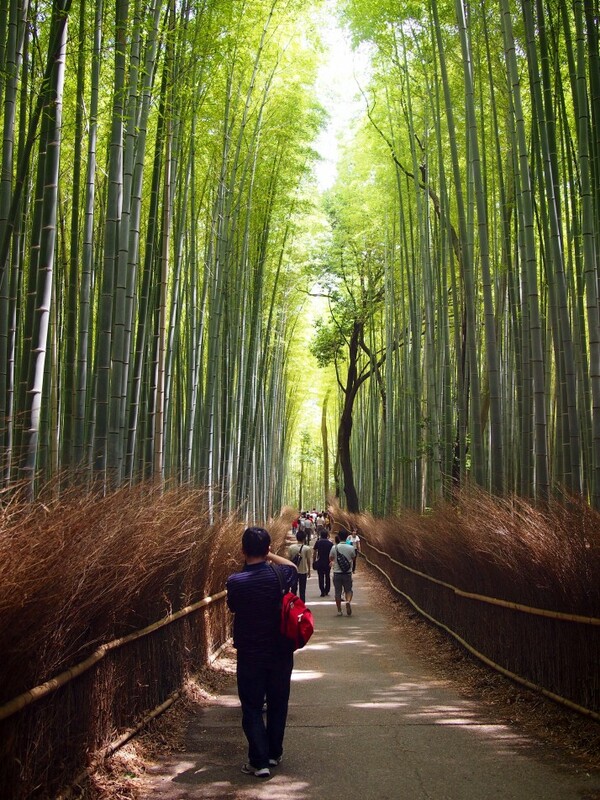 Kyoto was the imperial capital of Japan for over a thousand years and has so many temples that it would be impossible to visit them all unless you had months, or maybe even years, and a serious level of motivation. 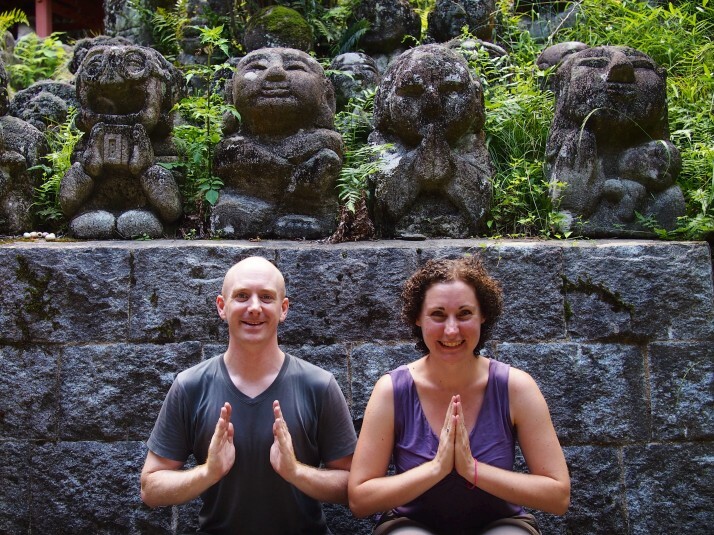 We enjoyed the ten or so that we visited during our stay in the city and found them to be just as varied as the wats that we discovered in Chiang Mai. 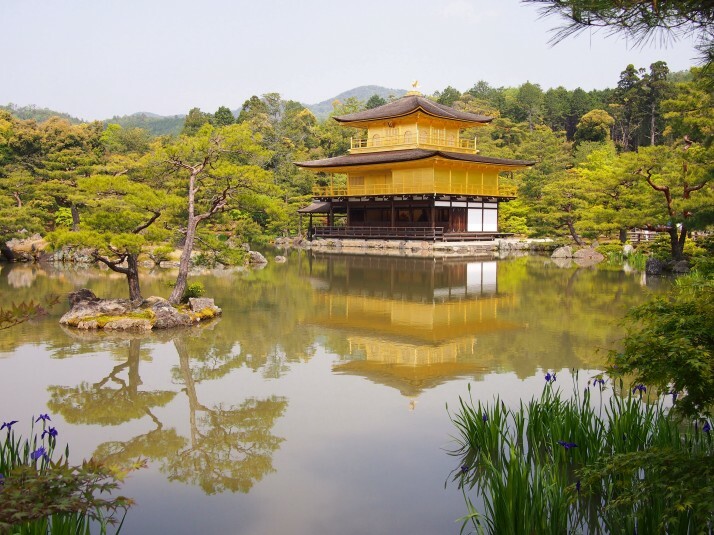 Kinkakuji, or The Golden Pavilion, is an iconic image of Kyoto and it didn’t disappoint. It is hugely busy and because of the volume of tourists you are constrained to a one-way route around the grounds which means that you have to move with the herd and can’t enter any of the buildings. Even so, we’re really glad that we went, even when you’ve seen photos the real thing is still utterly breathtaking. 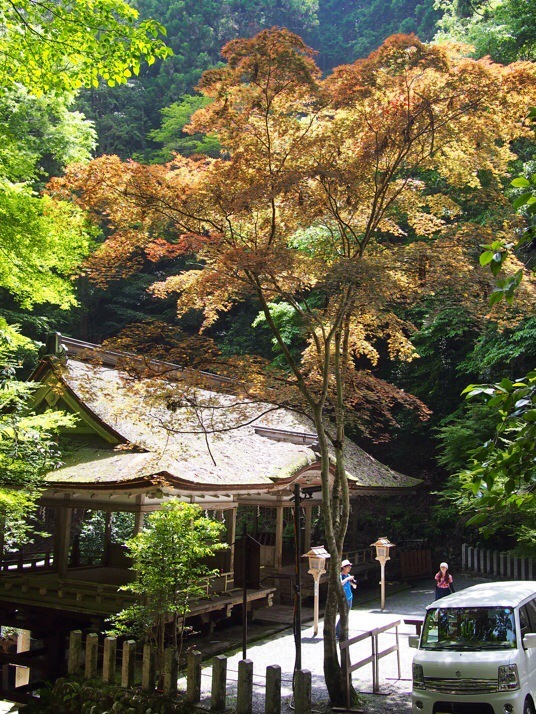 Another busy temple, Tenryu-ji is situated in Arashiyama in north-west Kyoto, right beside the famous Arashiyama Bamboo Grove. 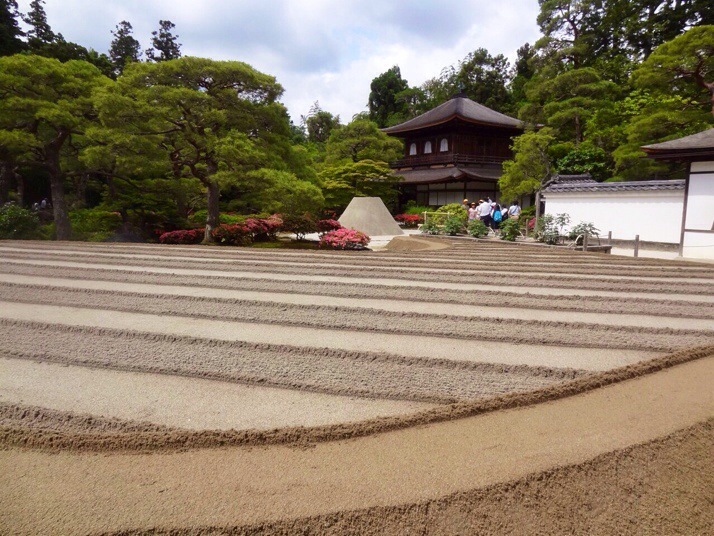 The temple’s Zen garden is one of the oldest in Japan and has the same form as when it was designed in the 14th century. It is lovely and we really appreciated the benches and area to sit on the terraces of the buildings around the pond although there were a few too many visiting tour groups to make it a really peaceful place to pause. 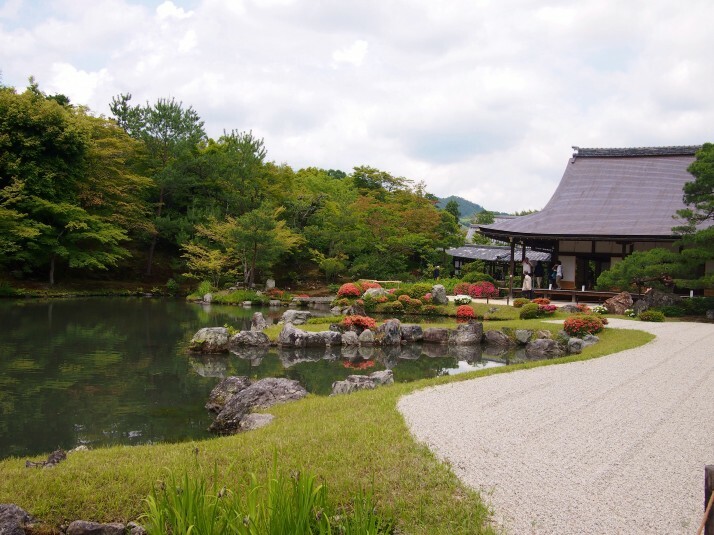 This temple is also in Arashiyama, just outside the main tourist trail area. It’s not in the Lonely Planet, we found out about it on another travel blog. The temple originally dates to the 8th century although it was moved to its present location in 1922, and the grounds contain 1200 carved stone figures of Rakan (disciples of Shaka, the founder of Buddhism) which were made during the 1980s by visitors from across Japan for the reconstruction of the temple. We loved that enough time had elapsed to cover them with moss so that initially they looked very old but on closer inspection the variety of expressions and accessories (tennis racket, beer bottles, walkman!) gave them an air of modernity. It’s a lovely peaceful temple, but also feels a little like an art installation, and is definitely one of our favourites. It seems as if this temple is on everyone’s itinerary, it was full of school groups as well as scores of other tourists, including quite a few Japanese dressed up in kimonos for the day’s sightseeing. 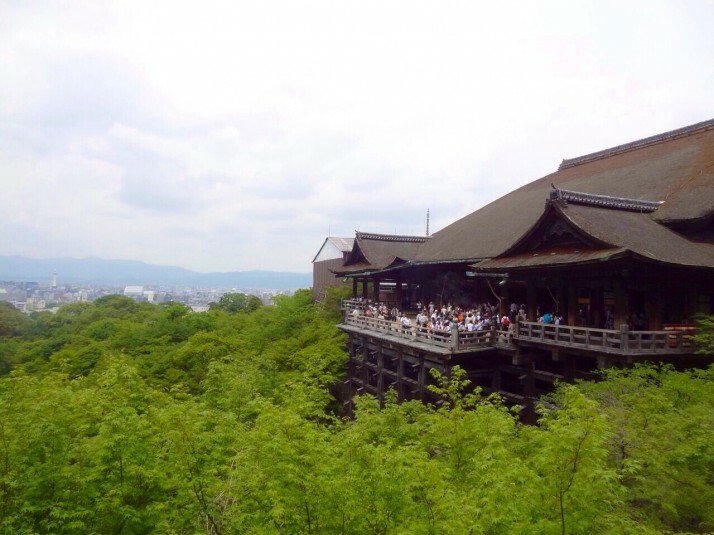 Even so the main hall of the temple perched on a hillside overlooking central Kyoto is an impressive sight. If you go we’d recommend stopping at Tainai-meguri before entering the main temple (go through the gate and up the steps, it’s to the left before you get to the ticket booth). It’s an unusual sub temple which you enter through a curtain into a pitch black corridor, following a handrail of large wooden prayer beads leads you to the centre of the temple and symbolises rebirth. Even with a group of giggling schoolgirls following us and stepping on the backs of our shoes it was a mystical experience. From the beginning you know that this is going to be an impressive temple. 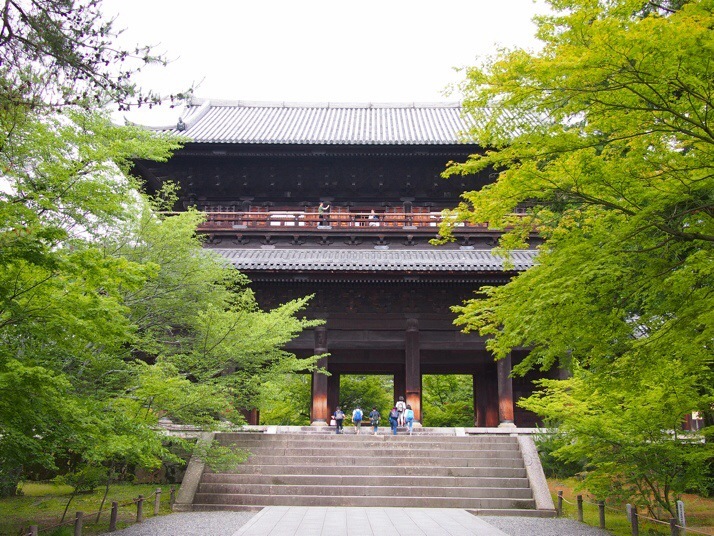 It has the largest temple gate in Japan, a self proclaimed ‘big bell’, and when the main hall is uncovered and reopens (scheduled for sometime in 2019) it looks as if it will be an imposing structure. But, for all that, there’s nothing brash about this temple, it has a quiet dignity and we liked how it seemed to be a working temple, minding its own business and almost ignoring the few tourists who pass through. Its seven ‘treasures’ are explained in a display case behind the temple hall and the corridors linking the three main structures are fitted with nightingale floors, so called because they ‘sing’ as you walk on them. It’s thought that they were used as a kind of security measure so that intruders couldn’t sneak in. I still can’t quite get my head around this one being a temple. 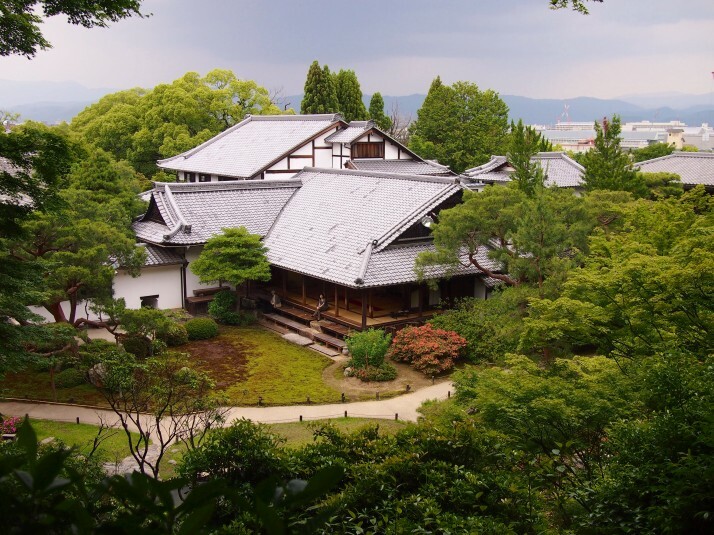 There is a line of massive camphor trees along the front shielding it from the street and the buildings are an interconnected collection of rooms with beautifully painted screen doors and views out into a peaceful garden. You really have to look for the temple elements – the Buddha images are modestly sized, there’s no incense and even the temple bell is tucked away in a corner of the garden. OK, strictly speaking this is a shrine not a temple, but you know what I mean… It’s located about a 30 minute bike ride south-east of Kyoto centre and extends all the way up the side of Mt Inari. It’s quite a long and sweaty hike to the top along a path almost entirely covered with thousands of bright orange-red torii gates with various small shrines along the way dedicated to the gods of rice and sake. We found the view through the gates to be really photogenic and it was much easier to find empty stretches the higher up the mountain we climbed. Ginkakuji means silver temple but, unlike at Kinkakuji, they never quite got around to applying the bling here. We arrived just after opening time to find the team of gardeners beginning a demolition job on the intricate raked sand Zen garden. Our next hour or so was spent sitting at the side and watching as with hosepipe, string line, special rake and a hefty boulder they reconstructed it. 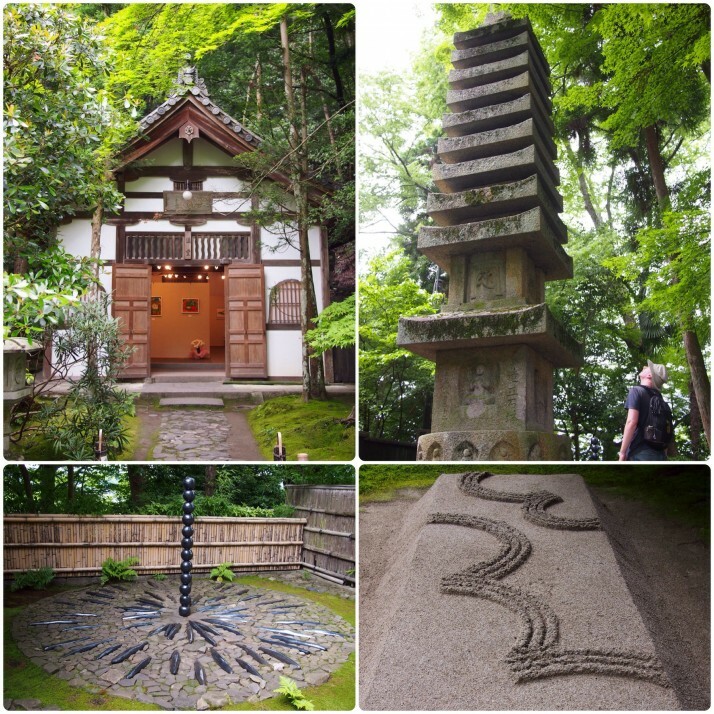 Even without the special experience of seeing how the Zen garden is engineered, the rest of the grounds are also beautifully kept (and busy) with mossy hillsides and glimpses into the temple buildings. 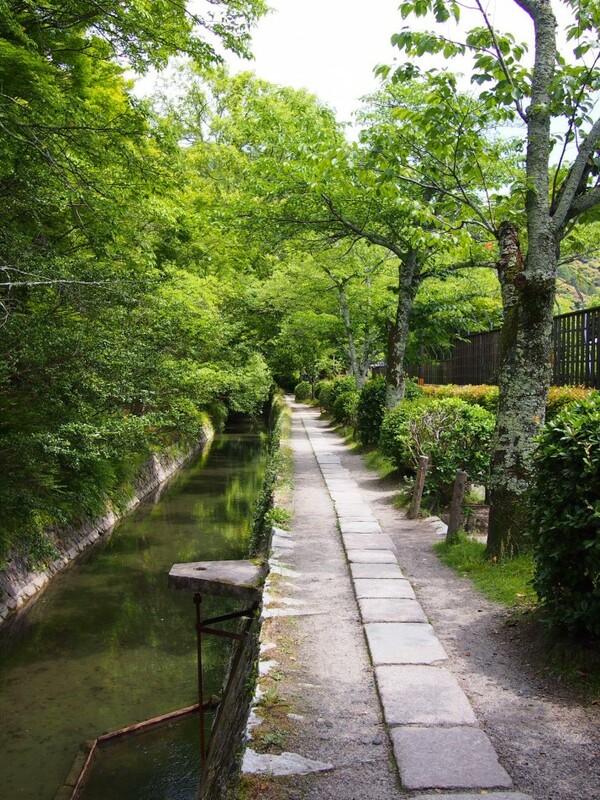 The Path of Philosophy is a canalside footpath which leads south from Ginkakuji. The next temple along it is Honen-in which the Lonely Planet highly recommended but which was nevertheless very quiet. There is a small garden surrounding the temple buildings as well as several pieces of art installed discreetly in the grounds. There’s also a dedicated exhibition room which hosts small temporary exhibitions. We enjoyed going in and speaking to the mother and daughter artists and an Australian artist who was also viewing, we even got a free cup of tea. Nanzenji also has an impressively large gate and it’s possible to enter this one. I found the ¥500 (£3) entry fee a little steep for the 20 minutes required to climb the steps and walk around but the view over the city is nice and the temple on the second floor is beautifully painted although unfortunately we could only peek through the windows and photos are not allowed. 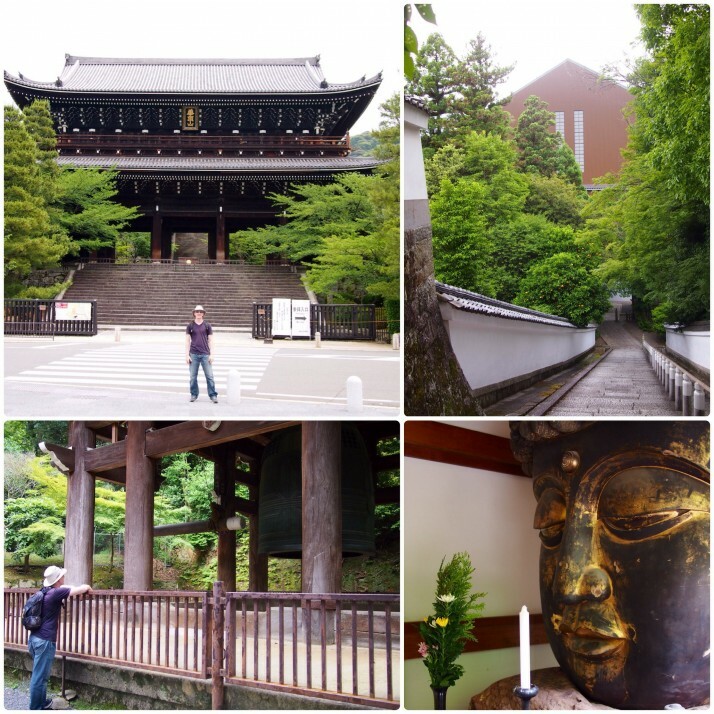 Afterwards we wandered through the grounds, past the brick built aqueduct and through a very quiet temple called Saisho-in to a shrine-temple in the forest built in front of a sacred waterfall. The main reason we visited the small town of Kurama, 30 minutes north of Kyoto on the Eizan rail line was to visit the outdoor onsen, but an hour or so’s walk up the hillside through the various temple buildings and a picnic lunch with a view over the surrounding mountains turned it into a pleasant full day trip. The temple was pretty, but we highly recommend a soak in the hot spring waters as a way to relax your muscles after the hike up and back down the hill. 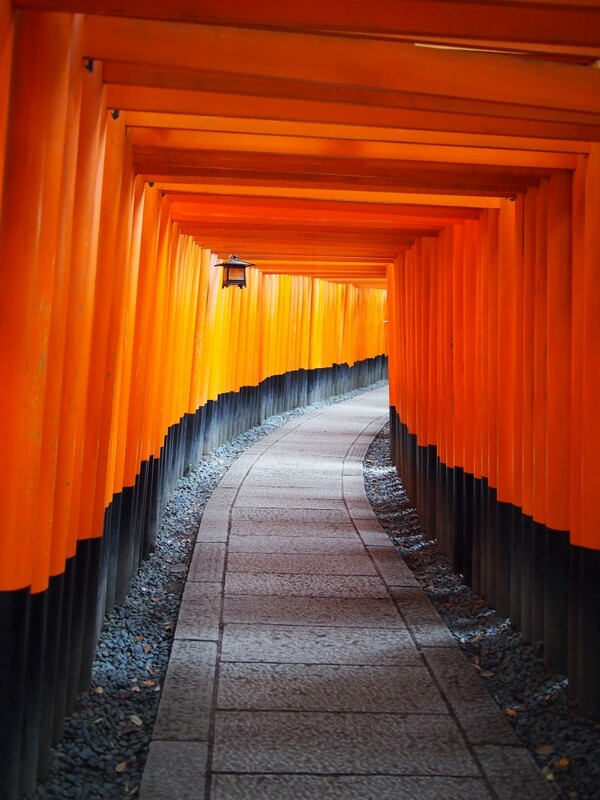 This entry was posted in Places and tagged Japan, Kyoto, temple on July 6, 2014 by Julie. What is 14 + 25 ?